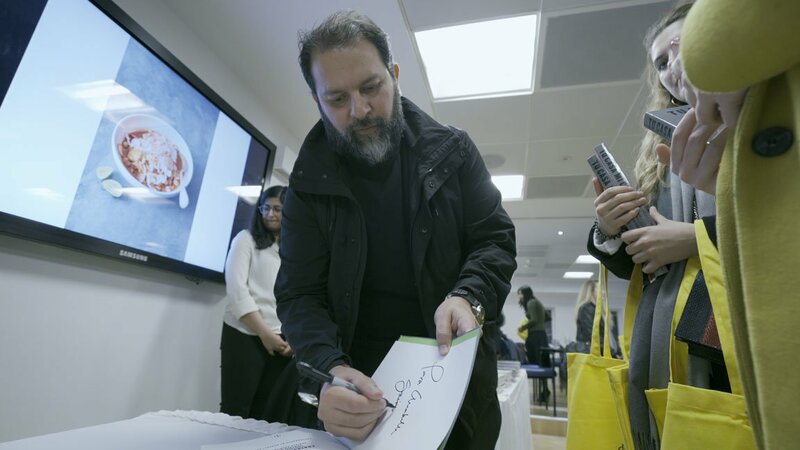 Le Cordon Bleu London were proud to welcome world-renowned chef Enrique Olvera for a Q & A and book signing, celebrating the launch of his new cookbook Tu Casa Mi Casa published by Phaidon. Enrique Olvera was born in 1976, in Mexico and is a globally acclaimed Chef and pioneer of contemporary, authentic Mexican cuisine. In 2018 S. Pellegrino’s The World’s 50 Best Restaurants ranked Enrique’s Mexico City-based restaurant Pujol at no. 13, and his restaurant Cosme in New York, at no. 25. His cookbook covers everyday food to share: aiming to unite people from all over the world, from all backgrounds and cultures to enjoy Mexican food. It offers a simple step-by-step guide for 100 of his most-loved and popular recipes, embodying the true heart of Mexico. Enrique paid homage to his hometown Oaxaca, where home cooking and street food made with fresh and home-grown ingredients are a big part of everyday culture. Regional food in Mexico is often based on the local social and cultural conditions and dishes by the same name can often vary from region to region due to availability of ingredients and the historical techniques of the area. Chef Enrique expressed the secret behind his great tasting cuisine is healthy produce, as the quality of soil is in direct relation to flavour. During the session, the audience’s questions were answered and Enrique provided in-depth responses, detailing his life story and his cooking methods. He told the audience that when you cook, the focus should always be on the message and the process, not the result. If the process is good, the result will be good. But what makes cuisine authentic? All guests received a signed copy of Tu Casa Mi Casa, and tasters of authentic tortillas, guacamole and hummus freshly made by Chef Enrique, as well as an opportunity to meet him and take a photo of the experience. To read the full review of the evening please visit Enrique Olvera's guest chef page.